With the Douglas .190 Wheels you’re signing on for bombproof, no-nonsense strength that’s geared towards severe competition and racing applications. That purpose is reflected in the wheel’s construction of .190inch thick 6061 heat-treated aluminum alloy that is polished to a mirror finish for great looks that don’t have to beg for attention. 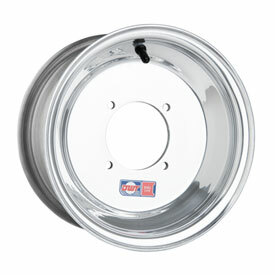 If you ride your ATV or UTV like you mean business, get a wheel that matches your style with the Douglas .190 Wheel. First time using Rocky Mountain Atv. Got a great deal on tire and rim package. These heavy duty rims hold up great under hard riding. The rear wheels I purchased never bent but the fronts did on a hard landing. I decided to go with these for the extra strength. They seem a little heavier but I’m not drag racing so that’s fine with me. Finish is great, I would definitely recommend them to anyone. These are a great looking, strong wheel. Fit on the hubs perfect and are a great wheel for anybody. Awesome wheels, super strong and light weight plus they look sweet! Great price and awesome quality! These wheels not only look great they perform great as well. Mostly used in hard pack trail riding. Wrapped a set of holeshots around these. It is a simple wheel, not to flashy, but they get the job done. I got these to replace the stock wheels on my 2005 Polaris Scrambler. They are nice and thick and much more solid than stock. Douglas rims are high quality and made in the USA . .190 thick aluminum is strong and high polish looks great. Would definitely buy again. These are way stronger than the thinner version. Taking a beating and still look great. Easy clean up. Highly recommend you spend a little more for a way better rim! I trail ride a Honda TRX400X with guys riding 4x4 quads. I didn't want a big heavy machine, I like my sport quad, but wanted more clearance in the rear. I went with the Douglas .190 Wheel 10X9 3.0 + 6.0 Wider offset, taller rim allows for a 2" taller tire without the side roll if I stayed with the stock rim height. The machine went from 4.1 clearance stock to 6" and that is with an after-market skid plate. I feel the height in the seat, but no handling issues at all. Before this I heard stones hitting my skid plates all day and I would occasionally get hung up in ruts. 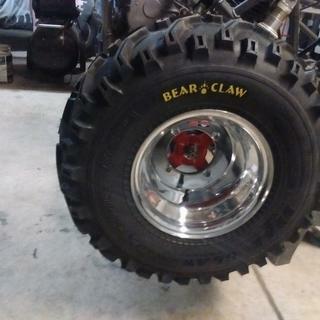 Since the new rims and Maxxis Razr II ATV Tire 22x11-10 I have no issues. It is also about 1.5 inches wider in the back. The rim seems strong, is easy to clean and looks great. There are fancier rims that may look better, but price and strength won out for me. Rocky Mountain tech support was great in helping me select this rim. Thanks! I would buy these again! The thick walls keep you up when your stance is wide. Prompt service and shipping. Work great. I would recommend this to anyone who owns a 700xx and wants a cheap replacement. It looks sleek and pretty durable! Bought as a replacement for OEM. Overall very pleased with the wheels. mounted them to some holeshots and have never had a problem. Very clean looking wheel that has an excellent finish. I bought these to replace a set of .160s that folded on me when I hit a rock in the dunes. These are a great balance of weight savings and strength. Bought these to replace my bent factory ones. I am happy with them so far! I ride wayne national forest alot and havent had any issues yet. I would buy them again. Love my new .190 DWT rims seem to be a lot stronger then my stock ones and came in the perfect size and offset for the best price. Also the polished ones looks sweet with a set of mean tires mounted! Rolled the razor in the sand dunes in Idaho and did not bend a wheel . A strong wheel ! nice wheels - got ta have em ! Had to hammer bends and dings in the rim after every ride. They don't hold up that well in Nevada. Good replacement rim, nothing special. Look Great and HOLD up even better. Douglas wheels are as good as or better than anything out there. Just received my rear wheel set. Looks great, fits awesome. FYI: You will need flat base lugnuts instead of the tapered. Haven't done much riding yet, but they seam solid. Other then needing new lugnuts no issues. Still 5 stars. RM got them here quick and had great customer service. Only place I'll buy wheels and tires for my ATV. Dont cheap out on rims your life depends on strong and durable rims. Light, strong and good looking! Your life will depend on your rims...don't skimp. Some of the riding here in Ohio is rocky and these replaced my stock rim that I toasted on a rock outcropping. They've chiped already so I'm not 100% happy but they look and handle better than stock. The front instanly felt lighter and sticker in the corners. Yup, nice shiney rims that have held up without fail. I have sand paddles on them. What's the bolt pattern on these wheels? BEST ANSWER: Bolt patterns are based off of your machine. You will need to enter in the make, model, and year of your machine and this will show you your stock bolt pattern. Can I use my stock lug nuts with this rim? BEST ANSWER: I used the stock lug nuts on my 2005 Polaris Scrambler. Torqued to spec and they are fine. yes, they will work fine. just make sure to torque them correctly. These take flat lugs. Not bevel. I use flange nuts. Not tapered lugnuts if holes aren’t conical. Will 23x8x11 and 24x9x11 fit 12x7 wheel/rim?? No, u need to get a 12” rim., The tires ur askn about, u need 11” rim. I have a damaged wheel on my quad, how do I figure out what size rim it is. Tire is a 22 x 11.00-8? BEST ANSWER: ATV Tire sizes are usually expressed THxTW-RD -- so that's an 8" diameter rim to match the wheel diameter (RD). And that seems unusually small to me but I don't have much experience with ATV/UTV (mostly M/C guy here). Rim measurements normally start with RDxRW -- the critical number is the rim diameter, if you get a 9" rim but your tire has an 8" hole, you can guess what happens there ... So you need an 8x.... The RW is the Rim Width and is going to be smaller than the tire width (TW). You can probably still measure those, you might also want to measure the offset to get a properly matched which is the X+Y numbers at the end where X is from the inside mounting surface (where it touches your hub on the ATV/UTV) to the inside edge of the rim (where it *starts* to flare out) and Y is from the mounting surface to the outside edge (and will equal the rim width) I'd give you a link to a good description but RMATVMC doesn't allow links in these responses. Matching the bolt pattern and sizing should be as easy as selecting the right machine from RMATVMCs drop down boxes on this page. It’s a 11”in diameter 8”wide and your local at shop or tire shop can tell you the bolt pattern or the owners manual for the quad will have that information. I have a 2000 Polaris Trailboss 325 with 22x11-10s on the rear that I would like to purchase a spare set of rims and "snow" tires for. What is your recommendation? Do I buy 10x9 rims for this? BEST ANSWER: I had a similar atv. I think that 10x9 are too wide and you should look for a 10x7. If not a 10x8. 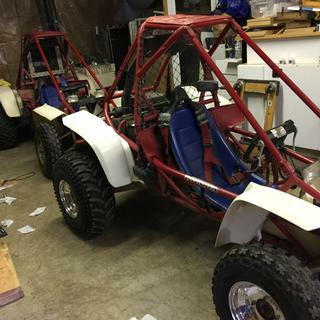 The Douglas rims are great I hand them on my last utv and they held up and are super light. The atv will not sit right on 9 inch wide rims. It will actually be slightly lower. Hope this helps. I bought 2 Rear Douglas.190 10X8 3.0 + 5.0 - for my 1995 POLARIS 400L 2X4, which is similar to the Trailboss, Part number 1087620005. They fit great and worked perfectly. Will this fit on front of 185s atc? I am buying Douglas 190 8x8 rear rims, will these fit over the spacers for a Yamaha Warrior? Bolt pattern is ok, it’s the raised centering circle I am worried about. BEST ANSWER: These two items will work together if ordered for the correct machine. This is a 4x137 pattern, correct? BEST ANSWER: You will need to enter in your make, model, and year of your machine in the drop down boxes above the product image. Once you select a wheel location you will be able to see the lug pattern next to the name of the brand. Have Lt500r,will these come in the 5x130 bolt pattern and will a 22x11-10 tire fit properly? BEST ANSWER: It looks like the rear wheels for this machine are a 5x130 and the fronts are a 4x166. If you enter in your machine in the drop down boxes and then select your location it will select the proper bolt pattern. If you get a size 10x9 wheel then this tire size will fit. However, you will have to check how much clearance you have under your machine since that tire size is 2 inches taller than your stock size. Can I use a a 22x11-8 tire on this wheel? Will my tires and wheels come mounted? BEST ANSWER: If you ordered a tire and wheel package they will come mounted. If they are ordered separately they will not be mounted. 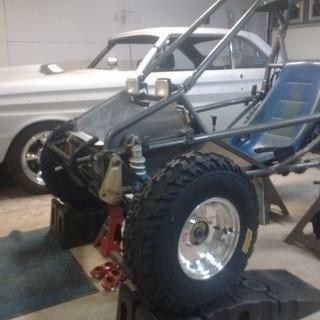 I will attach the link the tire and wheel package builder if you'd like to that. Each package comes with two tires and two wheels mounted. Are they sold in pairs or singels? BEST ANSWER: Wheels are sold individually. How much do these wheels weight? BEST ANSWER: Appropriately 8 pounds.